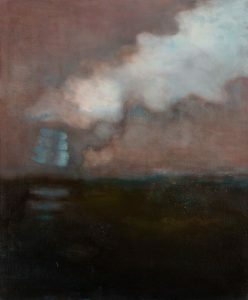 During the last week of “Coming to Light, Encaustics by Angela White” and “NOMAD, The Art of Alonzo Davis“, the Schlesinger Art Galleries is hosting a special public presentation of Confluence 2019, the DC region’s annual publication of critical writing on the visual arts on Tuesday evening from 6:30pm The speaker is Phil Hutinet, the publisher of East City Art. 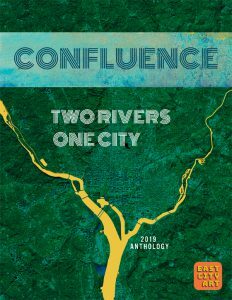 East City Art, DC’s visual arts publication of record, has released its second annual anthology of critical writing titled CONFLUENCE: Two Rivers One City. The 30 essays of the anthology present some of East City Art’s most compelling writing and document the DC region’s most prominent influences on regional visual arts culture. The title of the anthology alludes to the confluence of the Potomac and Anacostia rivers which flow through the region affectionately known as the “DMV” (DC, Maryland and Virginia). 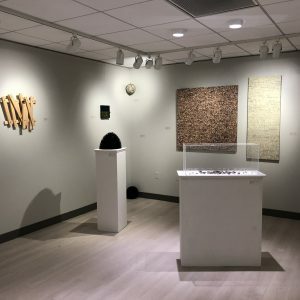 CONFLUENCE 2019 offers insight into DC’s art world with in-depth critical writing and full color photographs of work by local, national and international artists displayed at regional galleries, museums and art spaces. “The dedication of the East City Art writing staff to publish serious art criticism has never been stronger. Articles with ample discussion make ECA an alternative to the condensed and often superficial reviews offered elsewhere of gallery exhibits,” explains Editor-at-Large and Claudia Rousseau, Ph.D. 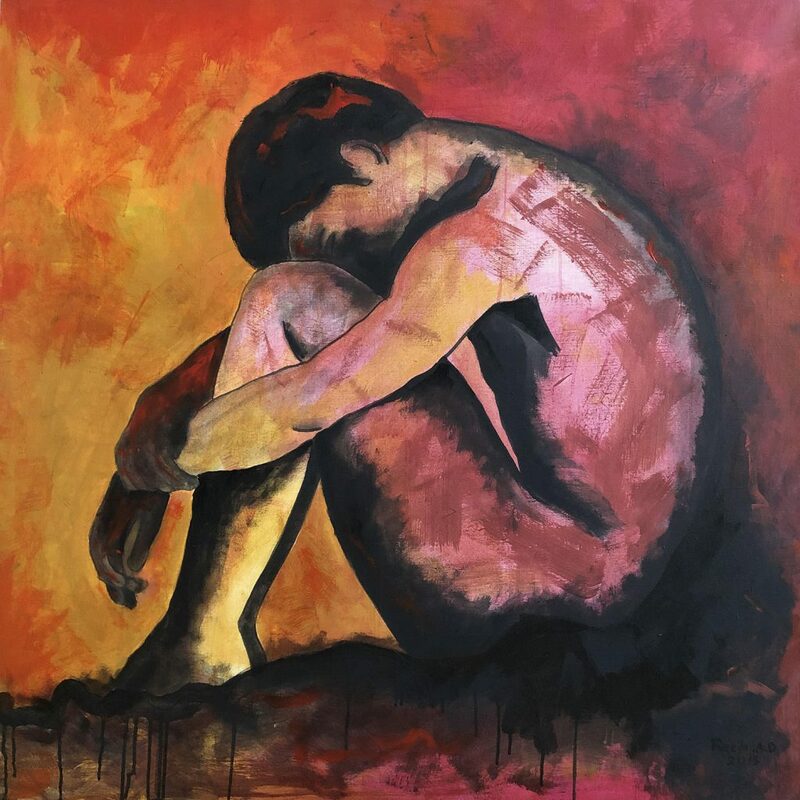 Publisher Phil Hutinet will present an overview of the reviews in CONFLUENCE 2019 while highlighting examples of work by local artists published in the anthology. During and after the presentation, audience members will have the opportunity to participate in the discussion and ask questions. We are very pleased to announce our early spring exhibitions and invite you to the opening receptions. We will have two new solo exhibitions opening on March 9th, 2019, Saturday afternoon 2-4PM. We pleased to present work from two of Alonzo Davis’s recent series, the Navigation Series and the Migrant Series. 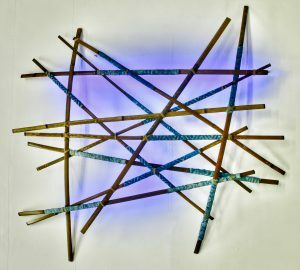 The Navigation Series is inspired by Alonzo’s long-time fascination with Micronesian navigation stick charts. Once used by the Marshall Islanders of Micronesia, the charts, studies of Pacific swell patterns and island locations, helped mariners navigate the waters in and around the region by canoe. The “Migrant Series” is a body of works that express our need for national and world concern of peoples having to leave their homeland because of inhumane conditions.The work in the series are approximately 14″w x 16″h x 5″d; each containing encaustic boats made of bamboo on a mixed media collage painting, with encaustic wax on board with burned and painted bamboo. To learn more about Alonzo’s work, visit his About the Artist page. Angela White is a fine artist inspired by physical, spiritual and emotional memories that create the visual depth and density of her work. Abstracts and seascapes compose the majority of her compositions. 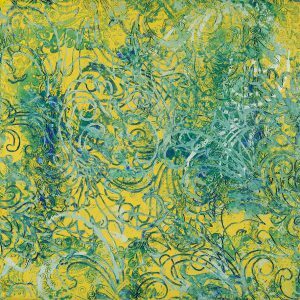 Natural and sensual materials such as oils and encaustic paint allow the blending of edges to create visual depth. By superimposing layers of media, the varied themes and processes of her work are exposed. To learn more about Angela, please visit her About the Artist Page. 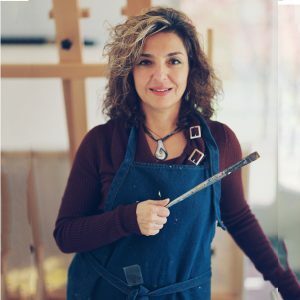 You are invited to join us Wednesday evening, February 13th, 2019 from 6PM – 8PM for an engaging talk with the artist, Azadeh Sahraeian. 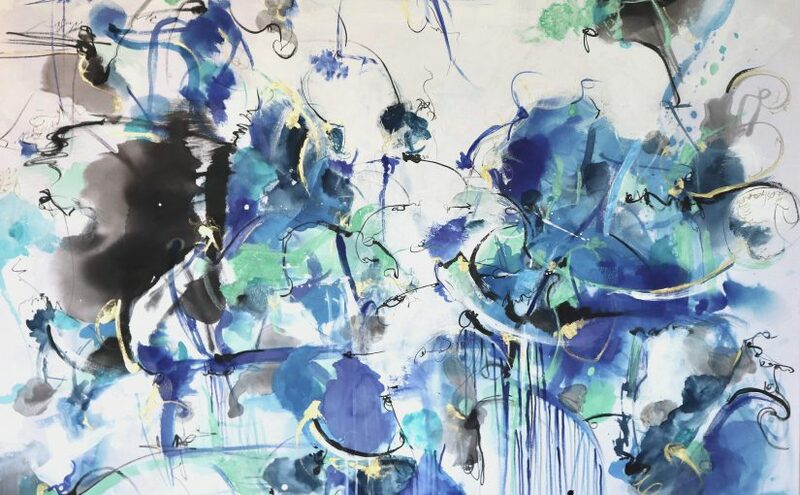 Azadeh will be discussing the extraordinary abstract drawings in her Schlesinger Art Center solo exhibition, “Form and Formation” as well as her artistic process. My artistic practice is more focused on the formation process rather than the form itself; hence, my drawings represent the process of genesis and growth; the lines grow from points that have been set on motion, as the plant grows from its seed. 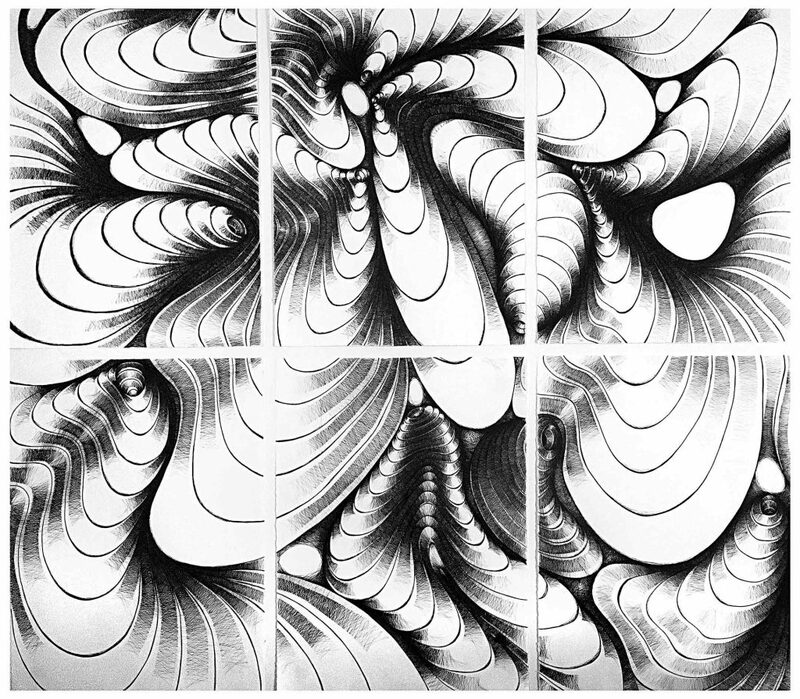 Each drawing begins with a single element, a “center”, and continues with duplication process in which strong centers evolve in levels of scale, pronounced boundaries and alternative repetition. 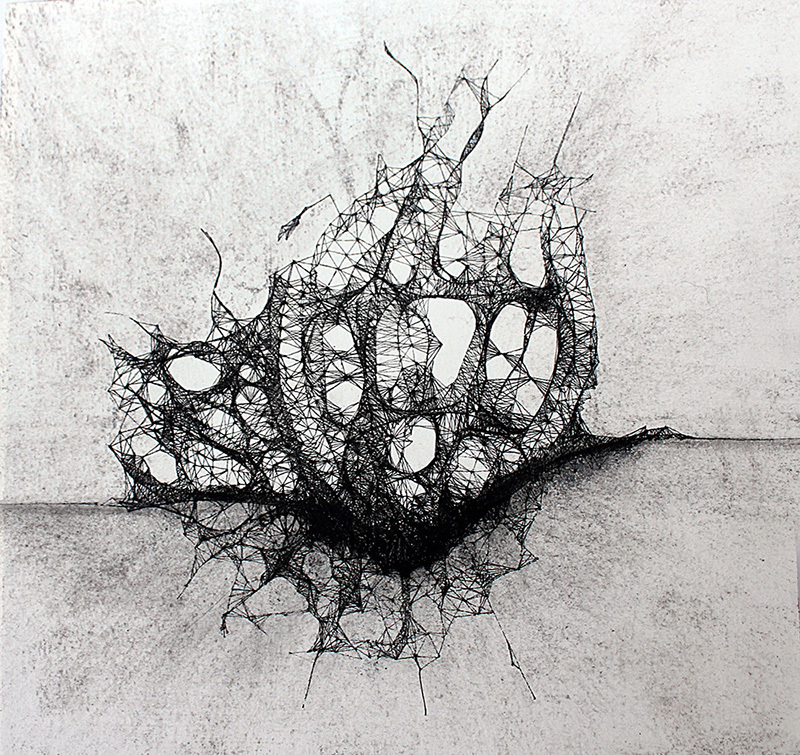 Emerging new centers continue till the whole drawing evolves. In this process there is a reciprocal insight between centers and the whole; as one finds ways to better understand the centers, the whole becomes better defined and the clarity of the whole makes centers more clear and yet they say more about the whole. Thus, my meticulous art works come along with a gradual formation in level of details. They are harmonious whole yet developed step-by-step; organic yet abstract; unpredictable yet mathematical; ordered yet chaotic; still yet fluxing. There is a continuous mutation in the process of emerging; an ongoing dialogue between formation and deformation in which my drawings unfold only a spectrum of it. As an architect and artist I like to create living things; not biologically alive but things that have a perceptible degree of life. Observing natural and man-made patterns and complex systems enable me to define my method in art. Hence, instead of replicating finished forms that are already settled, whether as images in the mind or as objects in the world I’d rather follow the order of these natural and artificial structures in order to generate my artworks based on their properties and characteristics. Please leave plenty of time to navigate DC traffic. There will be plenty of parking in the Visitors Garage. The Schlesinger Forum galleries is pleased to present the two major projects by Brian Dailey in collaboration with the Photography and Media Department of Northern Virginia Community College. The first opening event for this exhibition is this Saturday at the Forum Galleries. Over the course of a two-year period, Brian Dailey traveled across the country with the objective of capturing individual portraits of the uncelebrated American electorate. He organized impromptu photo shoots with more than 1,200 citizens, including those with no interest in politics or voting. In the portraits, each individual expresses their personal identity casually in dress and pose, while their political identity is a chosen backdrop: blue for Democrat, red for Republican, grey for Independent, green for the Green Party and orange for those who do not vote. The resulting body of work, “America in Color” challenges our perceptions of the many components and individuals that shape the American political process. As an architect and artist I like to create living things; not biologically alive but things that have a perceptible degree of life. Observing natural and man-made patterns and complex systems enable me to define my method in art. Hence, instead of replicating finished forms that are already settled, whether as images in the mind or as objects in the world I’d rather follow the order of these natural and artificial structures in order to generate my artworks based on their properties and characteristics. Syriana is a series of very personal statements of intellectual and emotional reflections on the humanitarian catastrophe we now lightly call, the Syrian conflict. They vary in color, from the blue of the Mediterranean, swallowing thousands of unwanted refugees, to the grey of flattened cement and the rubble of deformed “skylines”. Unidentified figures of children frozen by fear, with a man weeping in silence. We are very pleased to invite you to an evening of artists talks with Lisa Noble and Travis Childers next Wednesday evening December 12th, 2018 6-8pm. Lisa and Travis have distinct visions where they explore memory and our experience of the day to moment. You can learn more about Travis Childers and Lisa Noble by visiting their About the Artists Page. The address for the Schlesinger Center is 4915 East Campus Drive, Alexandria, VA 22311. There will be parking available in the Visitor Parking Garage right across the Circle from the Schlesinger Center. We are very pleased to announce the exhibition receptions and final solo exhibtions for 2018. You are invited to join us this Saturday November 17th, 2018 2-4PM for Travis Childers, Lisa Noble and Matthew Pinney. 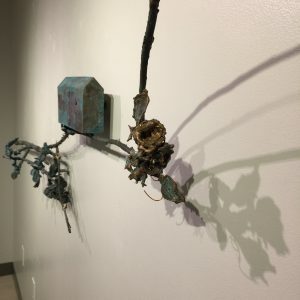 Accumulations: Mixed Media works by Travis Childers is in the Fisher Art Gallery. 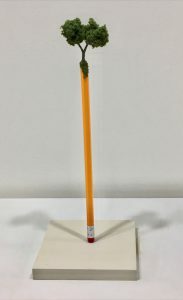 Travis begins with everyday objects – newspaper clippings, staplers, pen tips and tops and transforms them into provocative objects that evoke the readymades of Duchamp and the process of the Dada movement of the 20th century. 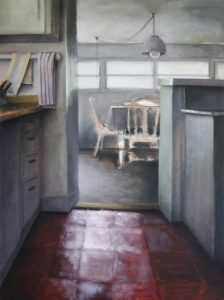 Memories of Home: Paintings by Lisa Noble is in the Passage Gallery. 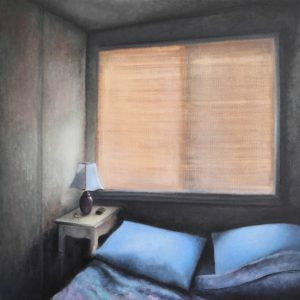 The interior in Lisa’s paintings are places of her past and personal history. They represent her efforts to visually map out the context of her childhood and early history. The Secret Garden: Paintings by Matt Pinney is in the Forum Gallery. 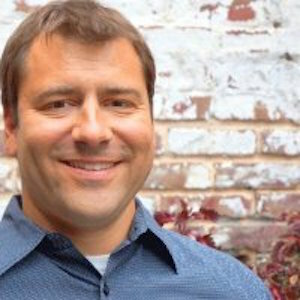 Matt Pinney is an assistant professor of studio art at the Northern Virginia Community College at the Manassas Campus. Matt’s paintings employ personal myths, reinterpretations of history, and investigation of cultural assigned roles to creative narratives that are unbound by time. 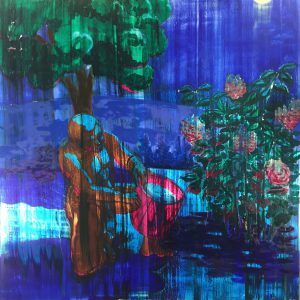 Say Behnam’s solo exhibition of paintings, Capturing the Vibrant, Transient and Eternal NOW is on display through November 4, 2018. We will be hosting a demonstration of the process that Saya uses to create her paints from plants, flowers, spices as well as stones and minerals next Tuesday October 30 12am – 2PM in the Forum Gallery of the Schlesinger Arts Center. Please learn more Saya’s process with the Q&A profile below and plan to join us next Tuesday afternoon – 12am -2PM. At what point in your life did you realize that you were an artist? From 13 or 14 years old. When I got so happy when copied an image from a cover magazine with a cheap watercolor box I had. I resisted considering fine art as a profession till many years after. I thought that cannot be considered as a real job. Was there a particular teacher that influenced you during your studies? I had a teacher at age 18 who as my father cousin. His character influenced me a lot. Are there art historical influences that are particularly important to you? Yes- I always was so impressed by the colors of Persian rugs and Kilims and miniatures was wondering how they produced the natural colors. What is the starting point for your process? For using natural colors: it was a total accident. One day drinking a hibiscus tea and by accident I split it on my white paper. I kept looking at the colors and how those were changing. I decided to give it a try at my studio . That was the starting point. You call your work co-creating with nature. Can you talk a little bit more about how you are co-creating with nature? I believe all the colors I use are existing in even one flower or plant I use. I am just a transformer. Some one who knows how to take them out and arrange them on the paper. Most of the time when mix or apply the colors on the top of each other I get a new color that is not what it was before. I believe I am not the only creator of my work. It is already in the nature and we co-create it. Is there a particular color that speaks to you over other colors? I am very attracted to shades of red to purple and blues. 7. When did you first start creating your own colors and what was your inspiration? Since my work is abstract, my goal was how the colors I create compose, interact and work together as a whole. The surface that you are painting on with the natural colors feels important. Can you tell us more about the quality of the surface you paint on – i.e. the silk, cotton and handmade paper? I realized natural colors prefer natural surface rather than chemically primed. For example natural silk and cotton and paper are the best. I normally use them instead of primed canvas. Do other art forms such as literature or music influence you? I love poetry. I do write poems from famous Persian poets like Khayam, Hafiz and Rumi in my art . Listening to music is a big part of my day. I daydream with it. I get inspiration, become happy, sad and calm. What advice would you give to a young artist that is just starting out? If you feel art is a big part of your soul, don’t afraid going after it and follow it professionally. It won’t be easy, but since artists’ reward is internal you can hang out there even when you don’t get result immediately. John D. Antone’s solo exhibition, The Home Inside” runs through November 4th. We pleased to announce that we are hosting a day time coffee and conversation next Monday, October 15th, 2018, 11am -12PM with John D. Antone. Please come out to meet him, view his works and join us in conversation. Learn more about John tomorrow and plan to join us next Monday morning for a conversation with the Artists. At what point during your life did you realize that you were an artist.? As I recall checking the “Art Major” box in my college application was the first commitment to being a “professional” artist but much later and in reality rather recently, I realized my purpose in life is to be an artist. Being an artist is related to curiosity in my opinion…..not a job. How did your experiences at Virginia Commonwealth University and California Institute of the Arts impact your artistic development? 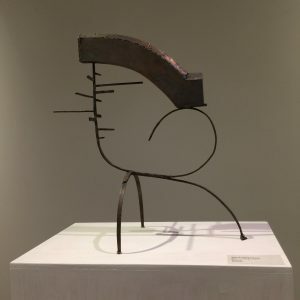 At VCU I decided to study “sculpture” because the Sculpture Department did not restrict sculpture to any working method. Our critiques addressed: concept, intent and effect. At Cal Arts they talked about the audience….who is our audience? This impressed me. It did not mean commercial audience but who we imagined we wanted to present our work. Times spent with other students was just as important as what happened in the classrooms. We were very lucky to be alive when there was such freedom. Was there a particular teacher that influenced you? My creative process is something like play. What artistic movements inspire you? – They can be visual but also literary movements. There is not a particular movement although I like art history a lot and literature is amazing. Art is an ancient language that repeats itself so I like to learn from the language of art. 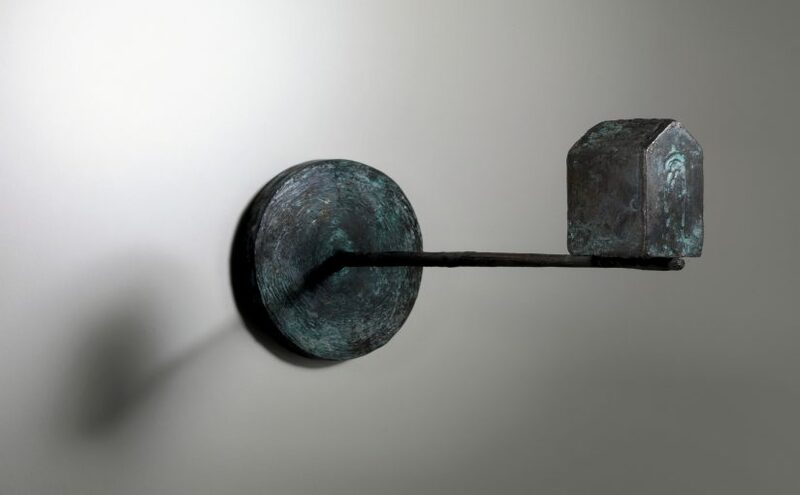 What is it about bronze that appeals to you creatively? I like bronze because it is both a liquid and solid. 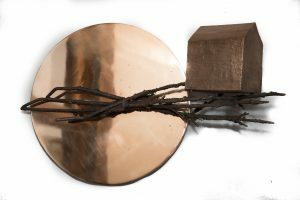 Describe the lost wax casting process? The lost wax process is ancient. Basically one makes a form in wax by direct or indirect means. Then the wax model is placed in a mold. It may be that the wax form need to be broken down into parts and reassembled later. This mold with the wax model is heated and the wax evaporates. Then melted bronze is heated and poured into the mold. Then the mold is removed when bronze has cooled. Then the bronze is cleaned and made smooth to the touch. Then color (patina) is applied to the finished bronze by heat and/or chemicals. When are you working on an idea for a sculpture – how do you begin? What advice would you give to a young artist starting today? I would say beware that art is dangerous and ask yourself: If you looked back on your life would you regret not doing what you love? We are very excited about our Fall Visual Art Receptions and we are looking forward to seeing you this Saturday, September 22nd from 2-4PM. 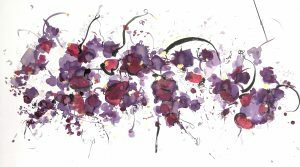 We have three solo exhibitions where each artists has a distinctive response to the natural world. In the Forum, we are welcoming Saya Behnam with her paintings made from natural colors and painted on silk and paper. The Home Inside: Sculptures by John D. Antone. 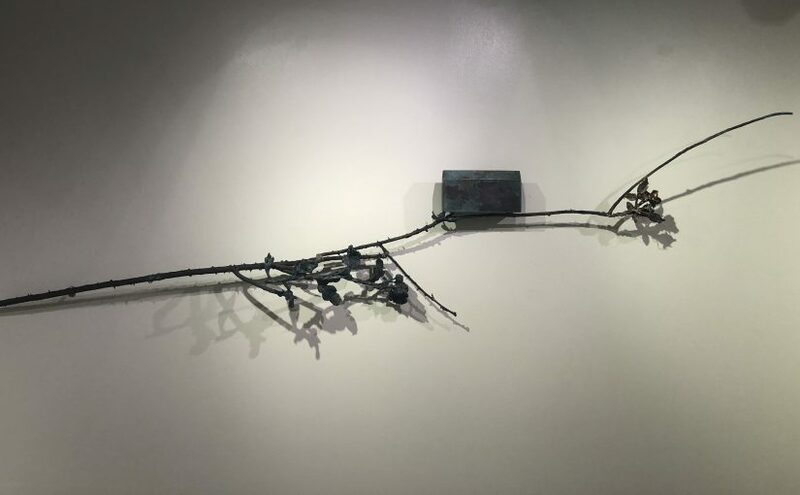 In the Fisher Art Gallery, John D. Antone will be showing is delicate and inspiring scupltures created in bronze and ebony. In the Passage Gallery, we are so very excited to be showcasing the oil landscape paintings of Teresa Jarzynski. Influenced by Luminism and the work of Corot, the are a lovely tribute to the natural world. Jenny the Wu – Bring your own Lunch and Learn! Lunch and Learn with Jenny the Wu on her exhibit A SOCIOLOGY IN LAYERS at the Schlesinger Arts Center. What do we mean when we call something Serious Play? How do artists develop and come up with the ideas behind their work? Grab a sandwich, and come down the hill to the Schlesinger Art Center and meet the artist Jenny the Wu. Jenny Wu will be giving a behind the scenes – straight from the creative source talk about her and Michael Holt’s work in the interactive exhibit – A SOCIOLOGY IN LAYERS. Jenny the Wu, like Winnie the Pooh, an artist and educator. She is the 2018 – 2020 Touchstone Foundation for the Arts Emerging Artist Fellow, and adjunct professor at American University and Marymount University. Jenny Wu was born in Nanjing, China. She holds a B.A. from William Smith College in Studio Art as well as in Architectural Studies, and an M.F.A. in Studio Art from American University.